Duolingo is one of the most effective apps to learn a new language with minimal investment. The interactive interface and use of games make learning a new language a very convenient and joyful experience. After a slew of courses, Duolingo is adding a new course for English speakers to learn how to speak, read, and write Hindi. This course will be useful for English speakers traveling to India as tourists or for work as well as for non-Hindi speakers in India. 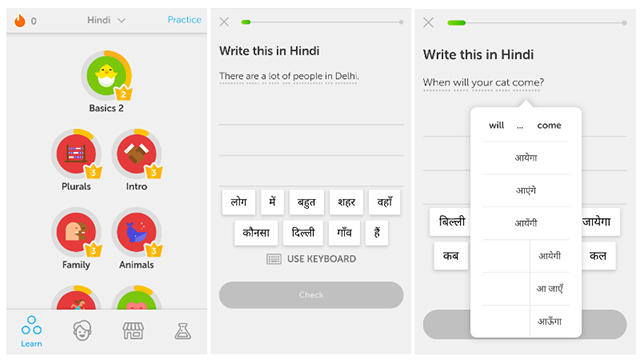 After extensive testing, the Hindi course has been made available on Duolingo’s website and will be eventually launched for its Android and iOS apps. Just like other language courses on the platform, this one aims to help users learn and retain the knowledge by breaking the information down into lessons of “the right length” and using interactive quizzes. The Hindi course focuses on bits of the language that distinguishes it from other common ones, especially English. This includes stressing on the variation of verbs with the changes in gender, and making it easy for users to differentiate between verbs, objects, and adjectives, reports Gadgets360. The company has high hopes for the Hindi course, and even for the country in general. Duolingo reports of having 10.1 million users in India, which is among the top 10 markets for the company. However, more than two-thirds of the Indian users on Duolingo have joined to English. It also offers English-learning courses in Hindi and other major regional languages. Duolingo currently relies mostly on cloud-based learning but it could also develop offline learning courses soon, citing the massive and challenges related to internet connectivity and offline opportunities in India. Following this announcement, the company is working on Bengali, Punjabi, Tamil, and Telugu courses for English speakers. With this, the company hopes to regain the lost eminence of Indian languages and aspires to see Hindi achieve a global status similar to other renowned languages.